Come One! Come All! to our Church Musical! 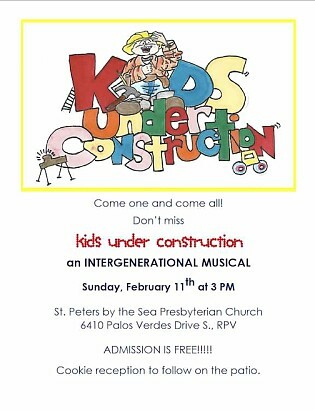 Bring the family to enjoy the musical "Kids Under Construction", based on the idea that no matter what age or stage we are in, God is still working with us to become all that we can possibly be! The cast of twelve is busy learning lines and moves to go with the rollicking music that will charm its way into your heart with energy and wit. An instrumental group under the leadership of Dave Chura will add to your pleasure. Don’t miss this performance. Invite your friends. We guarantee you’ll go out singing our theme song and be invigorated by all the fun and touching moments you’ve just seen on stage. Admission is free. Cookie reception immediately following!